Are Pets Important? Will Comes into his Own. Blog Home >> Animals >> Are Pets Important? Will Comes into his Own. Meanwhile, it’s a gorgeous fall day here. My digital camera broke this morning, or I’d show you more pictures of Will working the lamb flock. I am busting out of my britches with pride for him… he is blossoming every day into a wonderful working stock dog. This morning the biggest ram lamb (probably 100+ pounds) turned to face Will down, ducking his head and threatening Will with a charge. Will held his ground (they were face to face, about a foot between their eyes) and stayed cool (I was saying ‘Stea-a-a-a-a-a-dy’ in my lowest and most soothing of voices) and the lamb finally turned and went where Will told him to. A few months ago Will would have exploded at the lamb, not biting but charging forward. That was okay for a young dog; the dog has to win in situations like that (sheep are not stupid, they learn very fast if they can beat a dog) even if the process isn’t elegant. However, it’s much better to keep things calm and quiet. A year ago Will would’ve backed up and the ram lamb would’ve won unless I came in to help (which I would if necessary.) Will just recently turned two, and it is a beautiful thing to watch him grow up and learn to control his emotions, and take charge when he needs to. But still, really, Wll’s primary value to me is as a companion dog. I guess that means, when it comes down to it, Will is ‘just a pet.‘ Like Lassie, he adds love and light and joy into my life every day. What a gift. 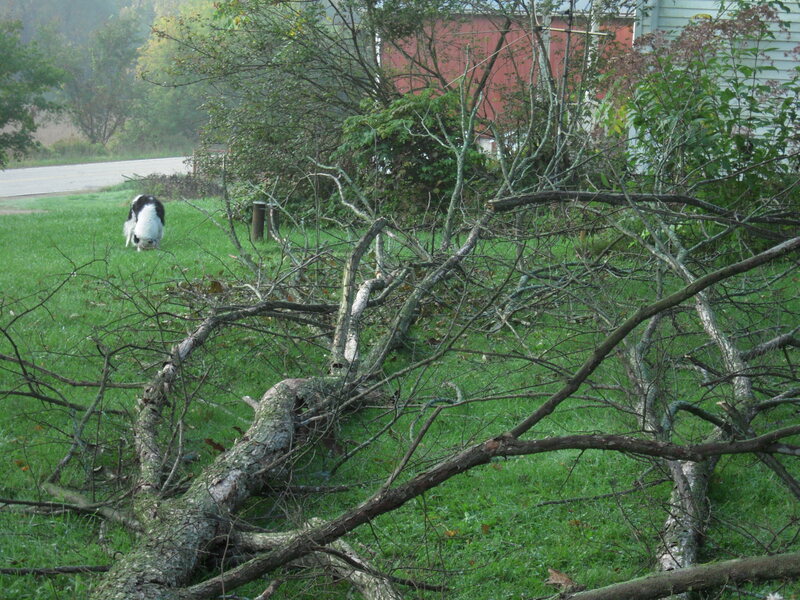 This is Lassie digging in the grass (a favorite activity for her) behind part of a huge dead elm clump that had to come down. 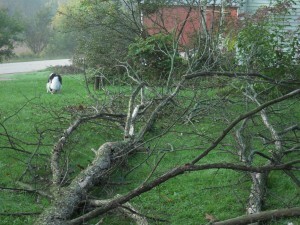 Cutting it up into firewood and making the rest into wood chips for the garden will take up most of this coming Sunday. 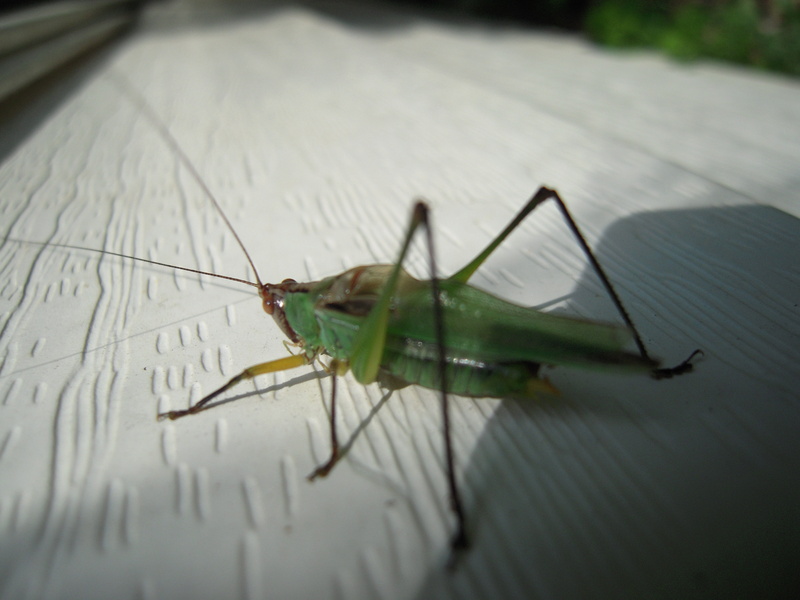 The last photo is of a Katydid. (who I originally identified as a Snowy Tree Cricket until graciously corrected by a reader! Whoops….) As common as Field Crickets and Katydids are here in Wisconsin, Snowy Tree Crickets are also common, and can tell you the temperature (no kidding). Just count the number of their chirps in 13 seconds (okay, I’ll admit, you often have to record them and slow it down to count!) and add 40, and you’ve go the temp in F. This photo was from a long courtship between a male and a female, all on the side of the house. I’m always justifying my “obsession” with my 15-month-old Australian Shepherd to others. What makes my “problem” even worse is that I’m a young, single, childless female. These adjective cause some people to judge that I’ve subsituted my dog for children and a life-partner. I’d like to say that these judgement don’t ever affect me, but that would be lying; however, that oes not change that fact that I unabashedly love my dog. He is a true companion and friend. We’ve recently taken up scent tracking and nothing has brought us closer than learning something new together. My Aussie will never be “just a pet”…he’ll always be “more than a pet” to me. I can’t begin to tell you how my pets have changed my feelings for all animals. I got my very first pet, a kitten, when I was 45. From the very first moment I held that tiny creature in my hands, I was hooked. My family now includes 4 cats and 3 dogs and I am dedicated to animal welfare and rescue. It saddens me greatly to see how many dogs and cats continue to be dumped to fend for themselves or are given up by owners who no longer want them. How can you share your life with these animals and not bond with them? They are not “just pets” to me. My favorite quote of all time is this: “Until one has loved an animal, a part of one’s soul remains unawakened”. Pretty much says it all for me. I agree with you that my dog Maisy is as important to me as oxygen, and as an asthmatic, I don’t say that lightly! She’s not even two, and even so, I tear up thinking of the day I will someday lose her. Sadly (or luckily? Depends which direction you’re coming from), I don’t think there are only two categories of people. I think that people manage to apply the “just a” label in many different ways. Having owned eleven rats over the course of six years before getting my two basset hounds, I know that there are plenty of people out there who would go to the ends of the earth and massively in debt for their dogs, but can’t understand why someone would spend $30 (much less a few hundred) to take “just a rat” (or mouse, or rabbit, or guinea pig) to the vet. And, unfortunately, some of these people even own small animals themselves (or allow their children to own them), but aren’t willing to care for them in the same way they care for their dogs or cats. And in the other direction, there are people who even view some groups of people as “just a…” – sometimes even below their dog. People place other animals (of all species) into different groups and apply different ethics and morality to each of them, and I think that one major challenge in terms of educating the public about animal welfare is to help people understand why we put our dogs and rats and what-have-you in a group to which we apply such high moral standards (for our own behavior). Been reading your blog for a little while now– found it after someone referred me to your website. I must fall somewhere closer to the middle. I place great value on pets, but am always wary of them being placed quite as high as human relationships. I have three young children and have desperately wanted a dog for at least three of the five+ years I’ve been a mother (since about a year after my12-year-old dog had to be put to sleep). Very few people seem to understand this and most warn me it’s impossible and not to burden myself. I sometimes resent this because these people wouldn’t dare say the same thing if I told them I was pregnant again. At the same time, I am frustrated to see people have a double standard when it comes to human-animal relationships. One example of this that I’ve lived is anyone (like myself) who has “troubled relationships” with a couple dogs over several years is labeled as foolish, risk-taking or irresponsible, while those who stumble from (human) relationship to relationship are generally told to “do what feels right” rather than what might be the most “responsible” thing. Both are about life-changing commitment that affect more than oneself, but being “casual” with an animal is outright attacked more than being equally “casual” with the heart of a fellow human. I guess I’m just disappointed and tired of waiting for the “Right” dog to come along… I feel like I’ve been looking for a long time. And it is harder being one of the only dog-people in my circle. Like B and Amy Jane, I think that there are not two camps, but a continuum of people caring about pets. On one end are people who abandon their pets when the animals become inconvenient. Further along are people like my parents, who have pets when their children are young and care for them quite well, but when the pets die of old age and the children are out of the house, are quite content to be without them (though I suspect my dad wouldn’t mind another cat). Then there are owners like me, who let the pets in the house and on the bed, and take them to the emergency room and have contingency plans in case of an earthquake, but would have to think long and hard about treatment plans that would cost thousands of dollars (because we don’t have those thousands of dollars). And past me are the owners that move heaven and earth to make sure their pets get the finest of care, bank account be damned. Keep looking, Amy Jean. It’s hard to have an energetic dog if you have preschoolers in the house (if only because the kids could get knocked down)and young energetic dogs take so much training. So maybe you’ll have to wait another couple of years, or settle for a mellower dog. But once you get into the dog-world, whether through dog sports or agility, you’ll have a whole ‘nother circle of friends, and you may even find they intersect with your original circle at some point! There will always be groups who don’t understand a person’s love and devotion to their pet, religion, country, etc. What is encouraging is to see the publications supporting the benefits of owning a pet, and the hospitals and nursing homes that recognize the advantages of pet therapy. These types of things help justify and validate the ‘family member’ status of our pets, and support our decision to treat them accordingly. Not that I have ever needed a research study to convince me that my dog is part of my family and deserves all the love, time, energy, and resources I have to offer – it’s just nice to have that kind of information handy when someone rolls their eyes at me when they find out how much money I’ve spent on my dog or why I put so much effort into a good pet parent. PS- Google “Just A Dog”: Musings by Richard Biby – it’s an awesome poem. The author captures everything I want to say about my love for dog – only far (far) more eloquently. Will seems to be doing so well, it is wonderful to watch them do what they love to & were born to do. 1. Dog as dog – they unemotionally view the dog as an animal – dogs have function but this group has no emotional attachment to the dog. 2. Dog in the family – This group recognizes that the dog has a place in the daily life of the family – but the emotional commitment is less than the third group. The dog is allowed in the house, but not on the furniture or in the bed. 3. Dog as family – this group views the dog as a member of the family, with the concomitant level of emotional attachment. I don’t know that this sheds any light on your point, but as an unrepentant “dog as family” guy I have occasionally reflected on this conversation as I try to figure out why some people do the things they do with respect to animals. I have tried to reconcile the differences as being akin to the differences between people’s feelings with respect to boats, bicycles, religion, politics, Hummel figurines, etc. However, I always come back to a belief that when you take responsibility for a living being, you owe a higher duty than you do to a hobby or even an idea. All life is too unlikely to treat it with less than the greatest of respect. Changing subject, sort of, I had occasion to watch some people working with herding dogs last weekend. I was disappointed to hear so much alpha paradigm based discussion of training practices and disturbed by the use of crops and herding sticks. Is that the nature of the beast in that discipline or can more positive techniques also be successful? I am very sad to hear that “Calling All Pets” has been cancelled. I discovered the show this June while visiting my parents in FL and have told people about the archived broadcasts (our local NPR station doesn’t carry it). I hope you find another way to share your knowledge with those of us with questions about our furry family members. Yes, I am one of those people that consider my dog(s) family. Since I was 4 years old, we always had at least one dog and often two dogs. The dogs were truly part of the family and my parents often went to great measures (financially, considering they were young and had three human children) to keep our dogs happy and healthy. However, they also taught us what to look for and how to decide when a dog is “suffering” and when it is time to “let them go”. That is perhaps the hardest thing about having a living being in your life, is making that decision. My dogs have been my best friends and seem to sense things about me before I do. For example, my brother’s dog, “Middy” uncharacteristically slept on my bed when I was sick. Turned out, I had appendicitis and emergency surgery the next morning. Somehow Middy knew not to leave me alone and stayed with me rather than with my brother. Each of the dogs I have known have enriched my life in a manner akin to my closest “human” friends. There is just something about the unconditional love that a dog is able to give that touches me and helps me through the daily challenges of living my life. AmyJane, as for finding the right dog, it might be worth talking to your local animal shelter and/or breed rescue groups. Let them know what kind of dog you are looking for and what your home life is like (i.e. ages and activity level of your children). They might be able to match you with the right dog. Sometimes dog from a good home gets turned in to the shelter due to unfortunate circumstances. An older (and sometimes more mellow) dog might be a better fit for you and your family. First of all, I am so thrilled that you have this blog! I am soaking up your writings like a sponge, as I love learning and reading about canine behaviour. It is absolutely fascinating to me. But the reason I chose to comment on this post in particular is that you hit a nerve with me. I truly HATE the words “just a pet.” “Just” anything is quite demeaning, in my opinion. Pets give us so much, every day. Whether we’re happy, sad, angry or otherwise, our pets love us and show us affection. When we need a shoulder to cry on, our pets are right there, eager to provide comfort. They are “just” nothing – they are our companions, family members and furchildren (I know, I know, so many people hate that term, but it does have positive connotations). I firmly believe that the world is divided into two groups – true animal lovers and those who have “just a pet.” And while those pets might be happy enough in their homes, they will never know the unlimited joy of bonding with their human family. The dog that sits in the backyard day in and day out might never know what it is to snuggle with their human on the couch on a rainy day, providing comfort and warmth. They will never know what they’re missing out on, but it still makes me sad. I am lucky enough to have 3 Cockers right now, and I cherish the relationships I have with each one of them. They’re all different, but they complete my life. They are never and will never be “just pets” to me. Patricia, I’m concerned and would like to know why the above paragraph would result in the termination of Calling All Pets? As for the phrase, “just a” anything, I don’t hear it from anyone, least of all knowledgeable breeders. Knowledgeable breeders select for animals with the most potential focused on health, temperament, type and working ability–traits that make wonderful pets too. Each puppy in a litter reflects the outcome of the breeding so much so that people are now registering all puppies in a litter in their name so they have permanent identification with AKC, and can be included in future research studies through club DNA repositories. Puppies are micro-chipped so if there is ever a need, the dog has a connection to its breeder or new owner. An “ET CALL HOME” lifeline of sorts. Breed parent clubs expect their members to be a life long resource to their dogs where ever they live. Failure often results in expulsion. We want our dogs to come back to us if their owners cannot keep them. Dedicated breeders are owners’ First Call in any situation and usually the best start resource for dog information including referrals to you or your books. Typically a dog’s show career is brief, rarely more than a couple of months except for a handful of exceptional dogs who are shown for a year or two. Training for the field or other performance activity may be a longer work, but each dog will be a gentle, loving friend to someone for the dog’s life. We work to get that right; both the puppy and personalities (people and dogs). Knowledgeable, dedicated breeders work very hard to reduce the risk of anything going wrong; clinical and genetic health screenings, diet and nutrition, exercise, emotional support and hours and hours of study before those puppies are born. Years really, as each person learns the history of their breed, its function, and who is where and what is what. So the phrase “just a” anything isn’t something I hear among my dog loving colleagues. My own little “pack” includes a pair of most beloved geriatrics (over 14) down to adolescents who remind me of junior high school children; overconfident one moment and unsure the next, but always buoyant and funny. They are all titled, most are champions, some field titled, but they are my little family and intergenerational to boot. Balance is important, and sometimes people must make choices. We want to be sure folks include the consequences of those choices as it relates to their pets and including them in their plans (given today’s economy). There is no shame in contacting your breeder or breed rescue and telling them you cannot (afford/declining health/owner dies) keep your dog anymore and asking for help. Their breeder or breed rescue should be their first call. I’ve one 14 1/2 yr old here who though I didn’t breed, I took in when he was 10 because of his owner’s failing health. He’s a fussy bachelor dog who is not particularly tolerant of puppy foolishness. I love him dearly. He maintains order, so long as he gets his naps. Now tell us, why would that passage cause WPR to end your show? Dang. I don’t understand because it looks benign to me. I’ve already written to them and wailed, and then alerted some of the kennel clubs in the state, but now wonder what the rest of the story might be? BREEDERS and ‘JUST A PET’: I completely agree that there are many responsible breeders who would never say “just a pet,” or devalue the importance of any pup that they bred. I bred for many years myself, and know how much work, love, dedication and ethics going into being what you and I would call a responsible breeder. So when I said “…breeders say it (“just a pet”) I didn’t mean “all breeders,” anymore than I meant “all pet owners ” when I quoted some of them as saying they wouldn’t spend any more money at a vet clinic. But there is a perspective held by some who are breeders that pet dogs are less valuable than show dogs (just look at the way they are priced) , just as some owners value working dogs more than companion dogs, etc….Those are the people I was referring to. As I said earlier, I am sorry that they choose to cancel the show, but glad to have had fourteen years to have talked about behavior, training, and to celebrate the importance of animals in our lives. Best Wishes and hope to find you on another show. Maybe youtube if nothing else? I happened to run into your blog with the photo of the Snow Tree Cricket. This photo is of a katydid, not a tree cricket. In the southern third of Wisconsin the Black-legged Meadow Kaydid is very common and I heard it wherever I went in southern Wisconsin throughout September and into October, and believe that your photo is of this species. You may have heard the Snowy Tree Cricket singing outside your house as I also had this species singing next to the room air conditioner, but I also had the Black-legged Meadow Kaydid singing pretty loudly in early October when I was able to get my first photo of the female. Still trying to learn this group of insects myself! While listening to Calling All Pets — with my head in the fridge cleaning — my librarian’s ears perked up. Patricia was talking about a program for children that seeks to improve their reading skills by reading to dogs. As an elementary school librarian, I constantly recommend that students read to their pets to increase their fluency. I have some absolutely wonderful books by author Sara Swan Miller entitled; Three Stories You Can Read to Your Dog, Three Stories You Can Read to Your Cat, and Three Stories You Can Read to Your Teddy Bear. The target audience is K-3, but they are so funny older kids would like them too. They are also fine for children with speech disabilities. I hate the “just a pet” line. The worst timing being after a pet has died and someone announces ‘It’s just a dog, go get another one’. My dogs are definitely members of my family. Many consider them to be child stand ins because I never had children but, I disagree. I never wanted children but always wanted dogs. According to my mother, I was asking for a dog as soon as I could talk and she firmly believes I was born wanting a dog, just didn’t have a way of communicating that until I learned to talk. I don’t see my dogs as furry children, I see them as dogs and appreciate their doggieness (made that one up). My dogs are not “just pets”, they are an integral part of my life and enrich my life in so many ways. I consider them to be, not only important but, necessary. The “just a pet” perspective is a part of life and it often exasperates me, but as long as those who have that viewpoint don’t abuse their dogs, I can live with it. Considering the number of dogs who need homes, I suppose living in a home where you’re considered “just a pet,” but still treated humanely, is better than being kicked around because you’re “just a pet.” I do believe that how people perceive their “pets” has a lot to do with how they were brought up, just as growing up in a family where any number of prejudices are accepted will mold a person’s point of view. When people step out of the mold to embrace another race, be it human or canine, then good for them. They are the winners! People are different. It’s what makes the world go round. For anyone reading this who feels judged negatively because he or she loves a pet as a family member, I offer this: first, consider who is doing the judging, second, forgive that person for her/his pathetic shortsightedness, third, let it go, and fourth, keep doing whatever it is that gives you an honest sense of wellbeing. I am a very new dog owner – we rescued two 6-year-old Italian Greyhound siblings 3 weeks ago – and just finished “The Other End of the Leash,” which I loved and which led me to your blog which I’m now reading from start to finish. I’m anxious to read your other books, too. I have a slightly different perspective, I think, on the “just a pet” comments. My parents both grew up on farms and have the very strong feeling that fins, fur and feathers should only be outside. They both had dogs and cats on the farm, but feel no connection at all to animals. 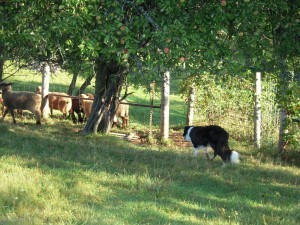 I suppose it’s the “dog as dog” feeling noted above – the dogs were a “tool” of sorts on the farm. My dad will sit next to our cat on the radiator (hasn’t yet met our dogs), but my mom insists that the dogs and cat come nowhere near her. I find it an interesting contrast to your life raising sheep on a farm, and having such a strong connection to your dogs. Thank you for your writing. It’s been helping immensely with our transition to dog ownership, and I love reading about life on your farm. Hi, Patricia. I’ve been a big “fan” of yours for some time now. Your writing is so educational and yet so full of humanity. Just thought I’d share my own experience on this particular subject. I had my own “just a pet” moment about this time last year. A funnel cloud was spotted very near to my house. I was at work and my thunderstorm-phobic border collie was at home (cowering in her bed, no doubt.) What would my Sophie do if a tornado damaged our house? Would she have enough sense to stay put? Or would she run amok in absolute terror? Why couldn’t I be home so I could take her down in the basement? I didn’t care about the house, just about the dog. I was freaking out and finally burst into tears. I mean, I was having a total meltdown. The next day a (non pet owning) coworker smugly said, “Glad to see you’re in a better mood today.” I tried to put it in a simile she could understand, “You mean you wouldn’t have been concerned if there were a tornado near your house and your grandson was home alone?” I guess I hit a nerve. She said, “Well! In the first place my grandson would never be left alone by himself. And in the second place, I wouldn’t equate my grandson with some stupid dog.” OUCH. Now, I certainly don’t see my Sophia as a “furry people.” That’s what I love about her, that she is a dog, that we live by different rules–sometimes I’m sure in quite different worlds!–and yet we can form such a strong bond in spite of our differences. I even enjoy listening to her snore when we retire for the night…something very ancient and primitve and so very RIGHT. I once remarked to another coworker (who is involved in a dog rescue group)that I was so lucky to get Sophie. She said, “No, Sophie was lucky to get you. Most people would have taken her back to the pound already.” Gawd, Sophie has her issues. Over the past four years, we’ve either worked them out or I’ve learned how to manage them. Or just accept them. Sophie is what she is. Just as I am who I am. Two unique individuals forming and reforming their lives around each other, each and every day. And, yes, with no apology, I love her.